Seated on the tram, reading on a spring day at noon, I’m distracted by a pink robe passing close to me. My eyes lift to a young face, pale and wet with tears. No sounds, just a face folding beneath its weight of pain. The rest of the person is young, thin, female, quite tall. She’s partially covered by a pink polyfleece robe. Beneath the robe two pale legs stretch down to feet in thongs. The girl looks about seventeen. Her features are Chinese. I check her for external signs of physical illness and detect none. She’s just a young girl silently weeping. Happily she’s not alone; standing close to her a taller girl clasps her gently. The second girl looks about the same age. She too is Chinese. The comforter’s free hand rests against the back of the weeper’s head. She bends the head tenderly forward and rests it on her shoulder where it stays a good time. The two stand, lightly enfolded, bracing against the far side of the tram. They ignore free seats close to them. The tram moves on, leaving behind them the beachside where they boarded. Were the two swimming? What grief or pain or random unkindness of life brought them from the beach? Ten minutes pass. The weeping face lifts from time to time and faces the tram, unseeing. Tears trickle. No words pass between the girls. The two have not moved from their station at the opposite side. A fair youth seated legside looks up and stares briefly, perplexed. His mouth opens, falls shut. Respectful of private suffering, he turns away. I too feel prompted to help, but diffidence holds me back. What’s more the friend seems to be comfort enough. Watching for my own stop, I look up at intervals from my book. A few stops out from my destination I look up and find the wall opposite empty. The girls have gone, pink robe, bare legs and tears, and all. Michael Benjamin Komesaroff was a conspicuous proletarian classmate of mine during our later years at Scopus (1963). He had a lived political ideology, like other Komesaroffs before him, an indivisible loyalty to Jewishness and to his country of citizenship. I recall his vernacular speech deafening us classmates in his espousal of Labor politics. We called him Kommo; he was a social democrat before most of us knew the term. Those same politics marked the generation of his immediate ancestors, and brought them to the attention of ASIO. At the time Lenin was preaching international revolution, a doctrine that unsettled Australia’s conservatives. Here were the Komesaroffs, newly arrived from that revolutionary hotbed. Where did their loyalties lie? ASIO became very interested in them, and now their descendant, with a career in international journalism behind him, investigates the investigators in a new book. “Reds Under the Beds” is the result. “Reds Under the Beds” describes the abiding interest of Australia’s intelligence community in a family who had immigrated in the early decades of the Twentieth Century. The author’s love and respect for those ancestors match his feelings for Australia. His meticulous research informs this account of a group whose hallmark was loyalty. The Komesaroffs were loyal Jews who became loyal citizens of Australia. Jewish loyalty mandated their love of Zion and their opposition to fascism, while loyalty to the country of adoption saw them acknowledged as exemplary citizens. Somehow ASIO became all too interested in the Jewish concerns of the Komesaroffs and quite blind to their lives as citizens. Michael Komesaroff writes his family’s story dispassionately, in clear and clean prose. His analysis of the political tides and times is revelation, as is his understanding of the contest for middle Australia between Social Democrats and Conservatives. With a calm that is unusual he identifies prevailing anti-semitic attitudes without inflating it beyond its true dimensions. Most topically, Komesaroff shows us how Australians of the most ordinary loyalty can come under pervading suspicion and investigation by Intelligence organisations. In our times, when mistrust of the citizenry is translated into something of a growth industry, a poised and intelligent balance is needed between the community’s needs of security and of community. In the case of these ‘Reds under the Beds’, ASIO emerges, showing limited intelligence. “Reds Under the Beds” is published by Hybrid Publishers and is available from most booksellers and Amazon. Further details of the book are contained on the Amazon website (here). 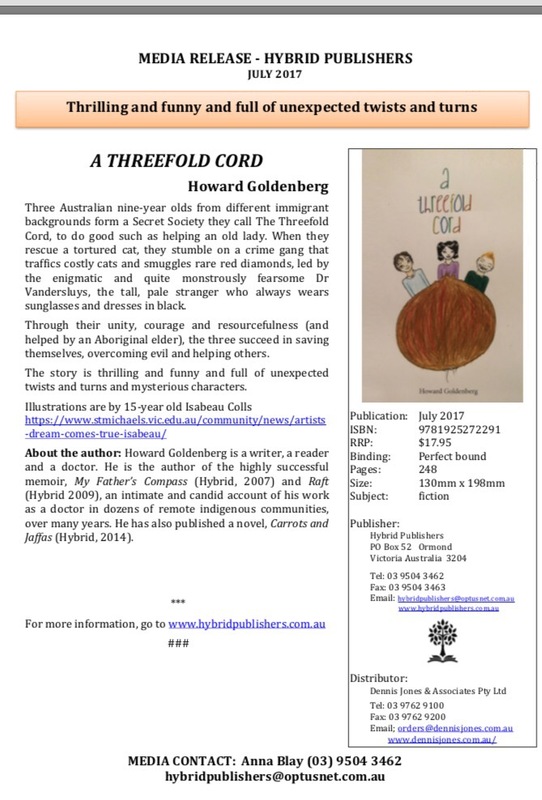 As outlined in the flyer, I have the pleasure of launching the book at 4:00 pm on Sunday 15 July at Glen Huntly Park Function Room, Glen Huntly Park, corner of Neerim and Booran Roads. I sleep between towers of books, some read, some half-read, most unread. No day goes unbooked. Some in my world of books inform or advise or enlighten. Others – not enough of them – delight or tickle me. Some inspire, some shock, others outrage and a few disgust me. Plenty bore me. But every so rarely comes a story that calls for that overused word, love. Robert Hillman’s ‘Bookshop of the Broken Hearted’ is a book to love. What do I mean here by love? In two separate surveys carried out a decade or so ago, respondents were asked to name their most-beloved Australian novel. I saw listed many books I’d enjoyed, by authors I admire. Before reading the results I made my own nomination – Tim Winton’s ‘Cloudstreet’. I read the rankings, and there, topping both surveys, was Cloudstreet.’Just so: Winton’s characters, their stories, their rich and variegated humanness, are given to us in their fulness, given us to love. ‘Cloudstreet’ stays with the reader and is recalled with love. ‘To Kill a Mockingbird’ is another such. Ripe for adding to that list is Hillman’s ‘Bookshop’. It broke my heart and it healed it. I laughed (my guffaws this morning alarmed a tramful of screen-trapped commuters) and I ached for the child. And for the adults who saw this child and that child torn from them I felt a distress that has visited me only once outside of a book, when the (false) report arrived that my child had a fatal malignancy. ‘Bookshop’ left me hopeful but not complacent. I will cherish the simple farmer who is the protagonist and I will tremble for him so long as memory abides. I invite you come to Readings Bookshop in Carlton, to hear Robert Hillman in conversation with this happy blogger at 6.30 pm next Monday, May 7th. Since the quiet release of ‘A Threefold Cord’ last week, giants of literature and history have joined a lengthening queue to sing choruses in its praise. The author penned the novel in 2013 at the age of sixty-seven years. For that somewhat flimsy reason he decided the work would consist of precisely 67 chapters. When he told his daughter-and-publicist the title was, ‘A Threefold Cord’, she replied: ‘That’s got to be a working title Dad.’ ‘No, that’s the title, darling.’ ‘No kid will buy a book with that title,’ was her crisp retort. For the pleasure of defying his firstborn the author determined the title would stay. 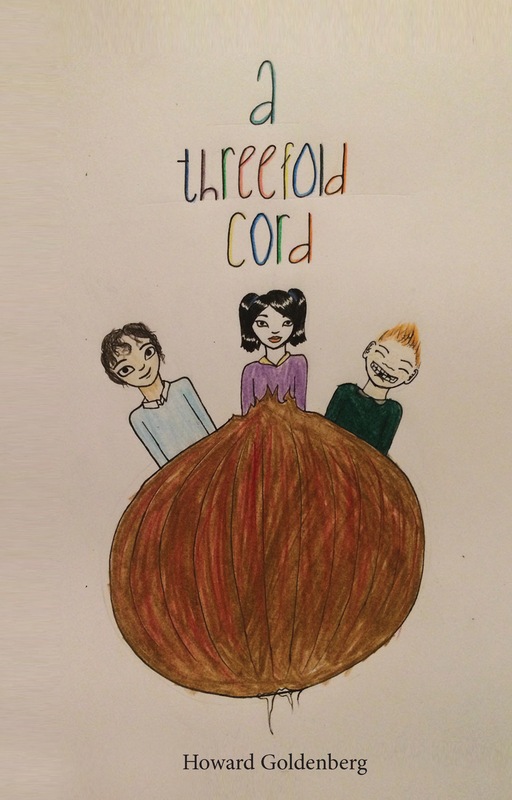 From its inception the author of ‘A Threefold Cord’ has always spoken of it very highly. ‘It’s a cracker of a story’, he told your reporter. Intended for shared reading between a parent and an adult of eight years and above, the novel has been trialled in readings to primary school classes across Victoria. ‘Yes, I’ve already written the first twenty-three of seventy-one chapters’, replied the 71-year old author.